Wait! 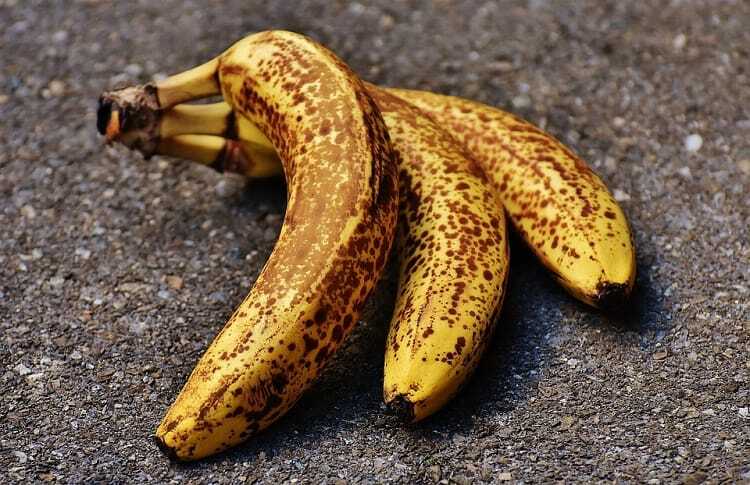 Don’t throw those overripe bananas! There are many easy ways to use them. Let us discuss some easy ways to use overripe bananas in recipes as well as for beauty and health. In a bowl, mash 3 overripe bananas with a fork. Mix 1 ¼ cups melted margarine with them. In another bowl, beat 2 eggs until frothy. Add 1 tsp of vanilla extract to the eggs and beat. In a third bowl, mix 1 tbsp baking soda, 1 tsp salt and a cup of sugar. Mix the eggs into the banana-margarine mixture. Beat lightly and add in the dry ingredients. Now add 3 cups flour and fold lightly. Do not over-mix. Grease a bread pan and pour the banana bread mixture. Bake for 30 minutes. Test for doneness. If the batter appears sticky or wet, put it back into the oven and bake for another 10 minutes. For a gluten free version of banana bread, use gluten free oat flour along with almond meal and xanthan gum. For all your delicious banana recipe desserts, use this delicious banana cream which can also be used in place of frosting on cakes, muffins, pies etc. Take 2 ripe bananas and 2 tbsp almond butter. Mix them in a food processor. Once you cream your cake or muffins, set in the freezer for 20 minutes. In a bowl, combine all dry ingredients, sift the baking powder and baking soda and mix well. In another large bowl, add bananas, milk, maple syrup, vanilla extract, vinegar and oil. Add the wet ingredients to dry ingredients and fold gently. Scoop the mixture into a lined muffin pan. Bake for 15-20 minutes or until a toothpick inserted in the muffins comes out clean. Remove from oven. Cool completely. Use vegan topping of your choice. Banana pancakes are another of the popular and easy banana recipes for overripe bananas. Method- Stir together flour, sugar and baking powder. In another bowl, combine eggs, milks and oil. Stir in the bananas. Add the wet mixture all at once to dry mixture. Stir until blended but slightly lumpy. On a hot, non-stick and well oiled girdle, pour ¼ cup of mixture and spread evenly. Cook until browned on both sides. Repeat with remaining batter. Serve with banana slices or maple syrup and butter. Do not throw overripe bananas. Freeze them in plastic freezer bags and add them to smoothies to sweeten them naturally and also impart a creamy texture. Even non-frozen bananas taste great in smoothies with yogurt and other fruits. Add a dash of protein powder for a scoop of protein. This is a delicious crispy recipe if you are looking for recipes for ripe bananas other than banana bread. Adding coconut milk and desiccated coconut makes the recipe exotic. Note: do not use overripe or black bananas for this recipe. You need firm ripe bananas which you can chop into slices. Method: Sift together flour and salt. Make a well in the flour and add an egg. Mix well to combine , then add the coconut milk. Add the sugar. Mix the batter until it is smooth. Rest the batter for 20 minutes. Chop the bananas into slices. Dip each slice into the batter to coat evenly. In a frying pan, heat 5mm of oil and shallow fry each battered slice. Drain, wipe on tissue to remove oil. Dust each fritter with desiccated coconut and sugar topping. Serve hot. The best way to use overripe banana is to make a hair conditioner mask or skin moisturizing face mask. Mix all the ingredients in a blender. Ensure there are no lumps else sieve the mixture to remove the bits. Apply to hair and/or skin. Wash hair after 45 minutes and face after 15 minutes. These are 7 easy ways to use overripe bananas. Know of any other recipes? Let us know!